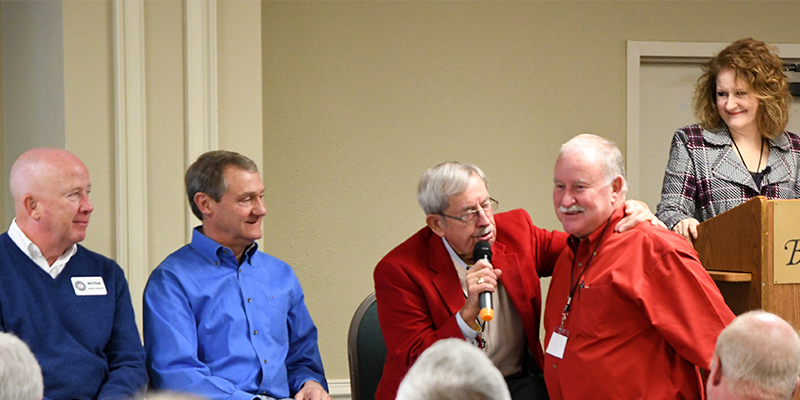 Reuben Davis (seated to my right) of Davis Wholesale Tire Co. shares some advice with Ricky Benton (standing) of Black’s Tire during the panel discussion at the Black’s Tire Customer Conference in December, as panelists Reece Hester of the North Carolina Tire Dealers Association (far left) and Reynold Hester of Hester Tire look on. Special thanks to Larry Hewitt for sharing this photo with me. It was a beautiful Sunday. A few clouds formed to the west, with a cool breeze offering welcomed relief after a hot August day. The sunset over the horizon was a vivid, brilliant deep red. Wishes were made on falling stars that night, easy to find against the deep velvet tapestry of a peaceful night sky. As mothers kissed the foreheads of their children and bedroom lights went dim, more clouds rolled in, blanketing the earth as families slumbered. Those families awoke to the sound of a freight train — the force of wind hammering against all they’ve built. It threatened the house their grandfather built, the structure their father expanded with hard work and determination, shredding the comfort of the familiar. There were few warning signals that day. No radar. No sirens. Just too many families who thought they were safe waking up to the loss of all they’ve known. Earlier that day, a neighbor heard it might storm but brushed it off as the chance for some much needed rain after a long, hot summer. In conversation, another man said it was nothing to worry about – the clouds would probably shift, so it’s much ado about nothing. They’ve had storms come through before and survived, he said. But the man across the street wasn’t so sure. He was the one who paid closer attention to patterns that others didn’t see happening around them. When his barometer dropped, he looked outside. The weathervane showed a shift in the winds. The birds chattered. The breeze picked up. By the time he recognized what could happen and set out to tell his neighbors, most were already asleep. The ones that heard his concerns thought that any storm couldn’t be that bad and shrugged him off or said he was crazy. “If it does happen, I’d be surprised,” was the common refrain. Allow me to introduce myself. I am the neighbor across the street, and I’m telling you it’s time to wake up. The winds of our industry have changed and clouds are building on the horizon. A few of the headwinds of this perfect storm include: corporate consolidation – folks with deep pockets outside the industry pouring money into acquisitions; lack of succession planning for independent owners requiring them to sell to a larger chain or close down; lack of operational sophistication, increasing the likelihood of a weak customer experience; lack of qualified technicians; fewer sharp, young people entering the field; spiking costs of equipment and software to perform today’s (and tomorrow’s) service work; increasing pressure from online competition; commoditization of products; embedded vehicle technology pushing drivers to car dealerships; car dealers’ fixed ops focused on increasing tire sales volumes; tire manufacturers minimizing steps between production and end purchase, going direct to consumers and cutting out middlemen; decreasing margins on better brands; shifting consumer expectations; buying habits shifting to a digital/mobile-first approach… I could go on. But the most damaging trend I see from independent tire dealers that remain resistant to change, hesitant to make any additional investment or simply not knowing where to begin. Welcome to 2019. The tire retail space is in the midst of significant change, and it’s coming from multiple points of impact. Some say that the changes taking place in the tire industry are nothing to worry about, convinced that it won’t affect their families and what they’ve built up. For those looking up and wishing on stars, hoping for the best, I invite you to look ahead instead. The reality is that after rolling under the radar for years, the tire industry is ripe for disruption. Look down Main Street USA and you can see that there aren’t as many independent, family-owned business left – especially those that focus on a high-dollar commodity item that is somewhat recession-proof. Take Amazon for instance. By removing the hassle and “friction” from the tire-buying process, consumers can now buy online and now set their appointment at one of 2,400+ Monro, Pep Boys or remaining Sears outlets. This, as that same consumer’s former tire dealer quietly loses opportunity after opportunity without even realizing it’s happening. It’s not as if the customer went to the tire store across the street – they didn’t go to a tire store at all. Instead they had a need, pulled out their phone, went online and got it done in a few clicks. Some say this isn’t really a big deal because Amazon isn’t in the tire business. Not true. Amazon is in the everything business. Their goal is to be the single source of product access and fulfillment for consumers. That includes bulky, hard-to-ship items like tires. According to data in July 2018 by eMarketer, Amazon was set to clear $258 billion in U.S. retail sales in 2018, which equates to 49.1% of all online sales and 5% of overall retail sales nationally. To think Amazon isn’t a threat because they lack the inventory, warehousing, locations to serve the tire-buying public is like thinking that Airbnb could never make it in the hospitality/hotel space because they don’t have a front desk. The best way to manage change is with change. Even with these market forces at play, independent tire dealers who work with the changes instead of against them will thrive. Throughout this New Year, we’ll offer you the steps and considerations to help you evolve your business approach and come out ahead. 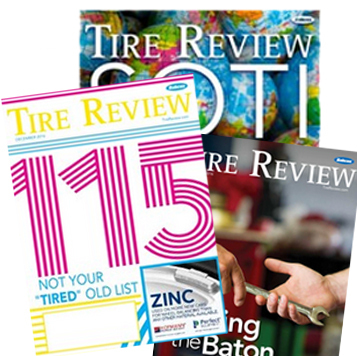 As uncomfortable as it might be to think about the trends taking shape in our industry, know that Tire Review is here as your partner to help you protect and grow what you’ve worked so hard to build. My favorite part of weathering a storm is to breathe in that fresh air, blue sky and sunshine on the other side. We’ll get there together.